My wife and I live in a town south of Boston, and we look forward to springtime when we can get outdoors more often in our wheelchairs and get to enjoy seeing colorful foliage and flowers after a bleak New England winter. 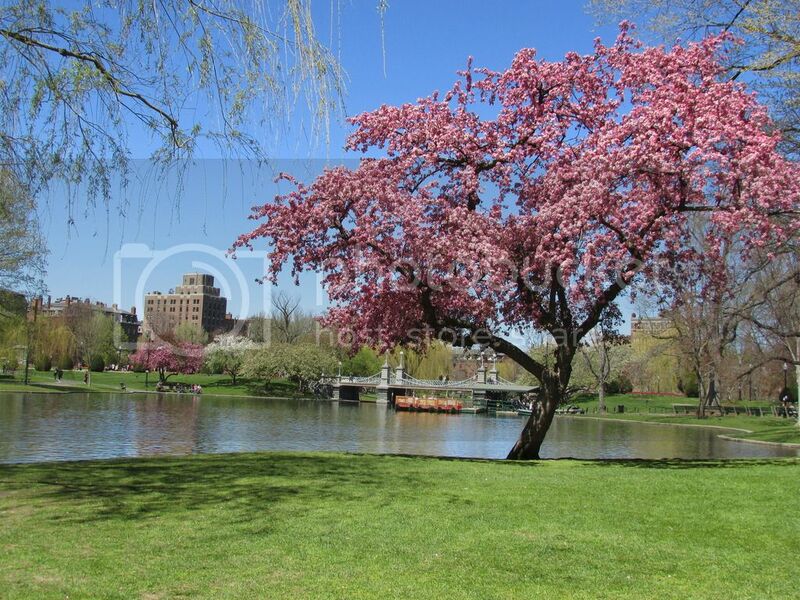 One of our favorite places to venture to is the Boston Public Garden. Just a couple of weeks ago we were once again strolling through that park, and even though it was a few days before the actual beginning of the month of May mentioned in the song about strolling through the park one day, it was still a delight to see the all the trees that were in bloom. I took the lens cover off my new camera and snapped this picture. 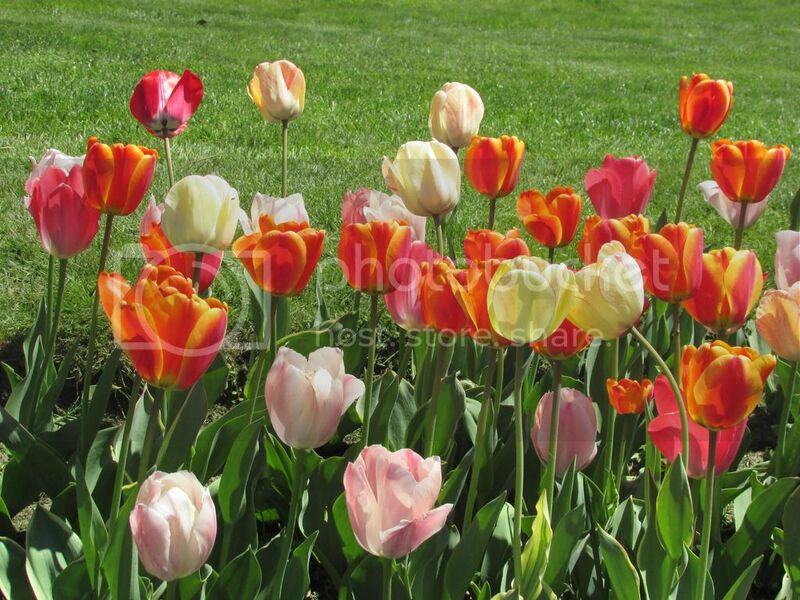 Once we wheeled past the blossoming trees, and rolled over the bridge that spans the lagoon used by ducks, swans, and the famous swanboats, we came to the beds of my wife's favorite flower: the tulips. The first ones which flanked both sides of the paved walkway were radiant red tulips. 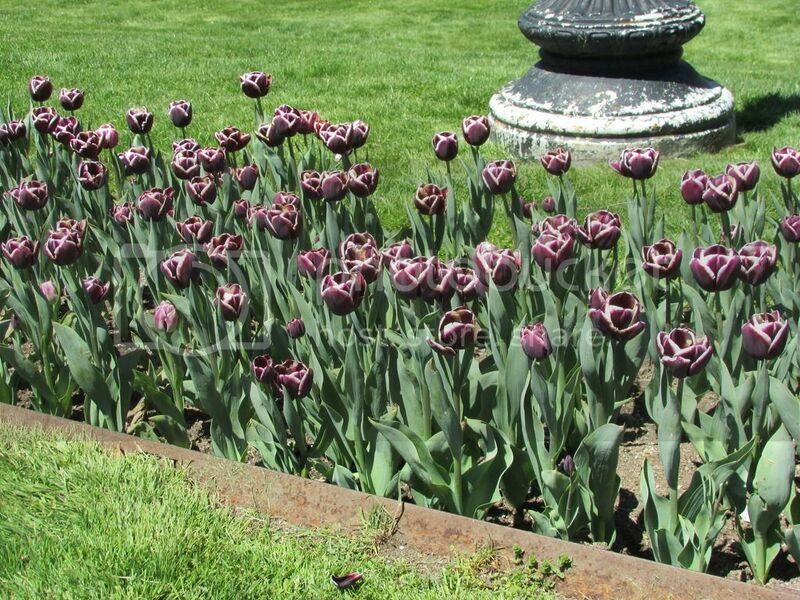 A little further on were some tulips that we unlike what we ever remember ever seeing before in the Public Gardens. They appeared to be black with white trim. 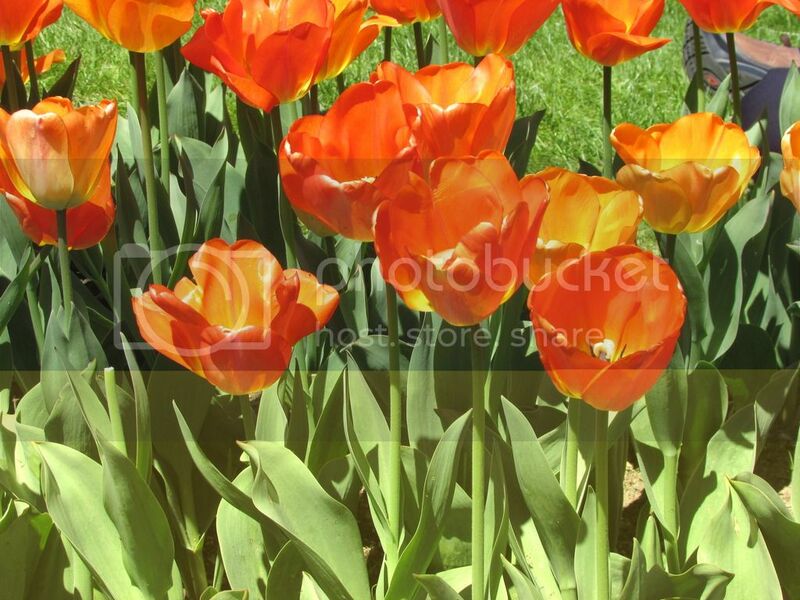 Next were rows of outrageously bright orange tulips. I took this close up of them so I could share the images online with you and hopefully brighten your day. Continuing along the path we came to flower beds with tulips of a variety of colors. I clicked a few more pictures of them, of which I'll share one of them with you here. The above photos are just a few of the several dozens of pictures I took of the beautiful flowers and trees that day. It is good to capture such images when we can, because not long thereafter the tulip petals fade, and the colorful tree blossoms gently fall and carpet the ground. 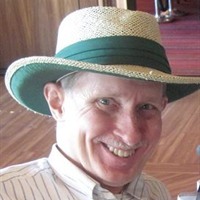 But we can enjoy the memories of seeing them and share the photographs with others. 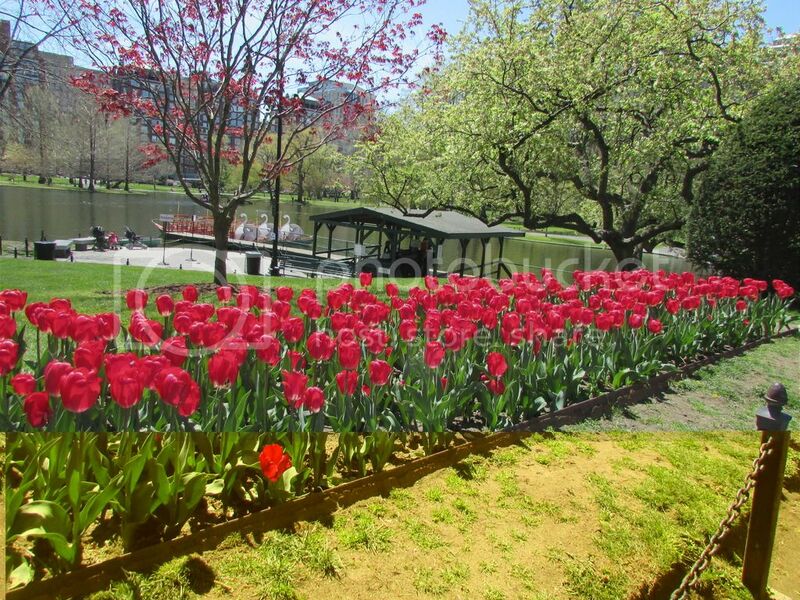 Even if you don't get to Boston when the tulips and trees are blooming in April or May, be sure to go visit the Boston Public Garden anyway, especially in Spring, Summer, or Fall. You'll get to take a leisurely ride on the Swan Boats, and see the bronze sculptures of the Mama Duck and her ducklings made famous in the children's book, “Make Way For Ducklings.” You'll also get to see the fountains, statues, and the wide variety of trees that were sent there from states all across the country.